Grand Connaught Rooms, London, March 12, 2012: Reports by IAN COLE and STEVEN DOWNES. 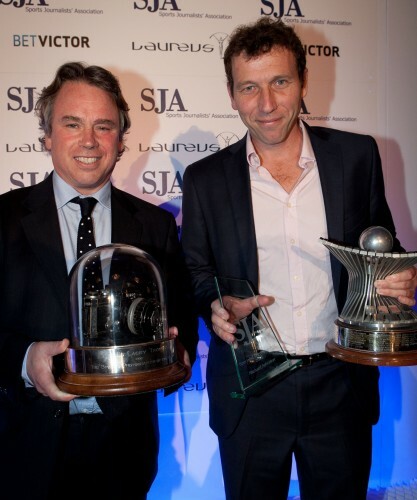 Michael Atherton led The Times to six top prizes at the SJA’s British Sports Journalism Awards, with The Thunderer taking the SJA/Laureus Sports Newspaper title for the second successive year, while their cricket correspondent was named Sports Writer of the Year for a second time, as well as taking the prize for Specialist Correspondent. The SJA Sports Photographer of the Year saw another past champion, the Racing Post‘s Edward Whitaker, reclaim the Ed Lacy Trophy that he had previously won in 2008. There was a special poignancy for Whitaker, as in his acceptance speech he dedicated the achievement to his father James Whitaker, the widely respected royal correspondent at the Daily Mirror who died earlier this year. The Times‘s winners came from across the board, with Matthew Syed winning Sports Feature Writer for a second year, Mark Souster’s exclusives on England’s Rugby World Cup reports taking Sports Scoop of the Year, and last year’s winner, Ed Hawkins, taking again the SJA/BetVictor Sports Betting Writer prize. The judges for the Sports Writer of the Year were drawn from a panel of national sports editors and other senior media figures, and more than 30 sports journalists figured in their voting. But cream rises to the top, and the judges selected the same top three as 12 months ago, with the Daily Mail‘s Martin Samuel and Paul Hayward, now with the Telegraph, also highly commended. Atherton, who was previously named Sports Writer of the Year for 2009, did not have matters all his own way, however, as the busy former England cricket captain was only among the runners-up when it came to SJA members’ voting for the Sports Broadcaster of the Year, which was won by BBC 5Live’s Mark Pougatch by a narrow margin from the BBC’s F1 frontman, Jake Humphrey. Other outstanding winners on the night were The Guardian‘s interviewer Donald McRae, declared Sports Interviewer for a third consecutive year; Jon Colman, from Cumbrian Newspapers, who regained the Regional Sports Writer title; and the Mirror‘s Ollie Holt, who regained the Columnist title he had won in 2008. Emerging talent was recognised through two awards. The Telegraph‘s Jonathan Liew took the Young Sports Writer of the Year Award, which is named in honour of Ian Wooldridge, the co-winner of the Sports Writer of the Year prize when it was first awarded in 1976. And 23-year-old Cambridge University under-graduate Michael Taylor was chosen as the winner from hundreds of entries for the first David Welch Student Sports Writer title, named in honour of the former Telegraph sports editor and stalwart organiser of the SJA Awards, who died last year. The power of photo-journalism was on display with freelancer Mark Robinson’s picture, published by The Sun, from the controversial Amir Khan fight last year, which shows the “mystery man” apparently interfering with the judging process during the world title bout. 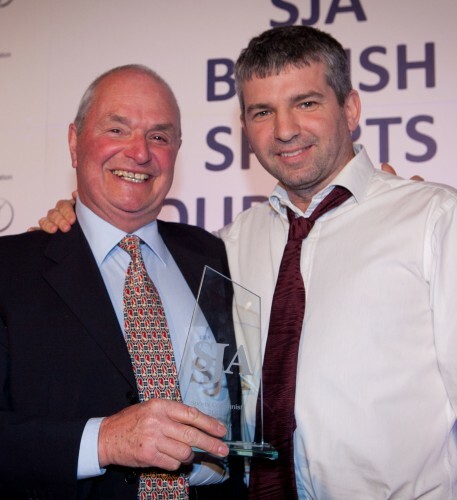 The Association has been involved with the presentation of the Sports Writer of the Year award for 35 years, but few past occasions could have witnessed one journalist so prominent across so many categories as Atherton was this year. As well as the title of Specialist Correspondent for his work as cricket correspondent of The Times, Atherton was also entitled to a share of TV Sports Programme of the Year, won for the second year by Sky Sports’ cricket team, in which he plays a key role as commentator, interviewer and pundit. And let’s not forget his “highly commended” in the Sports Columnist category and third place in the Broadcaster of the Year poll. Judges of the Specialist Correspondent category found Atherton’s writing “in a class of its own”. It was, they said, full of authority, reasoned opinion and understanding. As Jackie Brock-Doyle, Director of Communications for London 2012, said in reading the citation: “You might say he has won by an innings”. Atherton was that he was able to attend the awards dinner for the first time and savour the acclaim. This year, that came from nearly 400 senior figures from British media and sport at the Grand Connaught Rooms in Covent Garden, the event being sold out weeks in advance – the first time that has happened in half a dozen years at least. “I’m usually in some far-flung corner of the globe covering cricket at this time of year so I’m really pleased to have made it here at last,” said Atherton. Inevitably at such events, there was some nostalgia. In a year which saw the sudden closure of Britain’s largest-selling Sunday newspaper, the News of the World – just weeks after they won the SJA’s Scoop of the Year prize – Screws’ sports desk veteran Freddie Burcombe was called up to present this year’s award to Mark Souster of The Times for his Rugby World Cup revelations of leaked documents on England’s performance. Souster’s story, said the judges, “led the news agenda for a fortnight”. Nick Harris’s work at sportingintelligence.com won the Internet Sports Writer category – now the section with the biggest number of entries at the SJA Sports Journalism Awards – for a second year, while for the first time, a single documentary programme won the majority of members’ votes in the Radio Sports Programme category – Depression in Cricket on BBC 5Live, which was fronted by another former England cricket captain, Michael Vaughan. The evening closed with the presentation of Sports Newspaper of the Year, sponsored for the first time by Laureus. 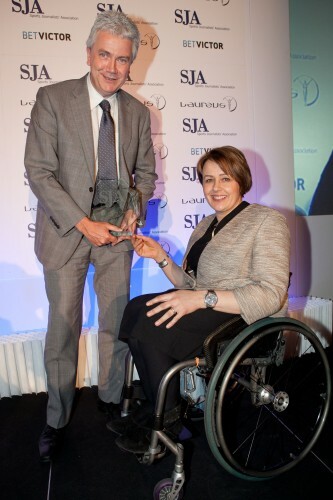 Having already collected five awards, there was little surprise when Baroness Grey-Thompson, Britain’s greatest Paralympian and a Laureus Academy member, announced that the winner, for a second year, was The Times. But on a great night for Atherton, he also had a reasonable claim to a share of the Television Sports Programme, as Sky Sport’s coverage of Test cricket retained that title. Check out our gallery of the short-listed entries for the Sports Picture of the Year by clicking here. View all of Edward Whitaker’s Specialist Sports Portfolio by clicking here. See the winning pictures from Tom Jenkins’ winning portfolio by clicking here. 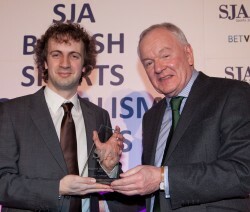 SJA Sports Writer of the Year: Michael Atherton (The Times). Highly commended: Martin Samuel (Daily Mail) Paul Hayward (Guardian and Observer). SJA Sports Photographer of the Year: Edward Whitaker (Racing Post). Sports Feature Writer: Matthew Syed (The Times). Highly commended: Owen Slot (The Times), Donald McRae (The Guardian). Sports Interviewer: Donald McRae (The Guardian). Highly commended: Owen Slot (The Times), Martin Samuel (Daily Mail). Sports Scoop: Leaked document exposes England Rugby World Cup shame (Mark Souster, The Times). Highly commended: Paul Kelso (Daily Telegraph) and Martyn Ziegler (Press Association). Sports News Reporter: Paul Kelso (Telegraph). Highly commended: Rob Beasley (The Sun), Martyn Ziegler (Press Association). Specialist Correspondent: Michael Atherton (The Times). Highly commended: Mark Souster (The Times), Henry Winter (Telegraph). Sports Columnist: Oliver Holt (Daily Mirror). Highly commended: Patrick Collins (Mail on Sunday), Michael Atherton (The Times). Young Sports Writer for the Ian Wooldridge Trophy: Jonathan Liew (Telegraph). Highly commended: Alex Kay (Daily Mail), Laura Williamson (Daily Mail). Regional Sports Writer: Jon Colman (Cumbrian Newspapers). High commended: Richard Wilson (freelance), Amanda Little (Cumbrian Newspapers). SJA/BetVictor Sports Betting Writer: Ed Hawkins (The Times). 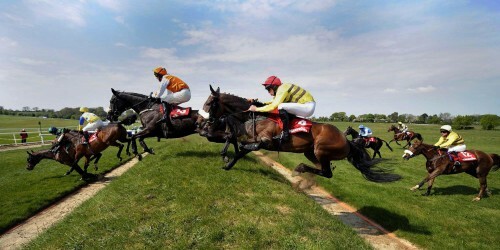 Highly commended: Steve Palmer (Racing Post), Simon Milham (freelance). Cartoonist: Nick Newman (freelance). Highly commended: Andy Davey (freelance), Kerber & Black (Sunday Mirror). Internet Sports Writer: Nick Harris (Sportingintelligence.com). Highly commended: Ben Dirs (bbc.co.uk), Matthew Christie (boxingnews.co.uk). Sports News Picture: Mark Robinson (The Sun). Highly commended: Phil Noble (Reuters) and Mike Egerton (Press Association). Sports Portfolio: Tom Jenkins (Guardian and Observer). Highly commended: Clive Mason (Getty Images) and Phil Noble (Reuters). Television Sports Programme (selected by a ballot of SJA members): 1, Test cricket (Sky Sports); 2, Open golf (BBC Sport); 3, The Truth About Drugs in Football (C4 Dispatches). For past winners of the SJA Sports Writer and SJA Sports Photographer awards, click here. 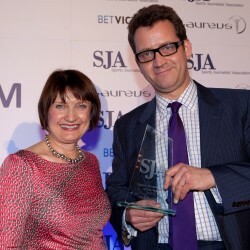 Thanks: The SJA would like to thank our sponsors and partners, Laureus and BetVictor, and to all the judges who volunteered to work on the 2011 British Sports Journalism Awards.